This morning’s unanimous vote by the board of SUNY Downstate to shut down LICH is simply unacceptable. Closing LICH jeopardizes the health and well-being of thousands of Brooklynites and will have serious effects on our economy. LICH provides essential medical treatment for thousands of Brooklynites with chronic conditions and those seeking emergency care—without it, they will lose their lifeline. Comptroller DiNapoli’s audit claims that LICH is underutilized, yet according to several reports, including a study by the New York Nurses Association, LICH averaged a 90 percent occupancy rate. And in 2010, LICH delivered more than 3,000 babies, and treated over 4,000 infants in its neo-natal unit and nearly 2,000 heart patients. The statistics clearly show that LICH is not underutilized. Furthermore, the New York Nurses Association also found that in 2012 there were well over 120,000 patient visits to LICH. Roughly 20 percent of those were emergency room visits, meaning without LICH, one out of every five patients would have had to go elsewhere, losing valuable time in the process. And in life threatening situations, every second counts. And the hospital’s hard working staff has clearly proven their capabilities and dedication as they are essentially operating with half the required resources. The facility has been staffed and budgeted for no more than 250 beds, yet the hospital has more than 500 beds! Sadly, these 2,000 dedicated doctors, nurses, and hospital staff are in danger of losing their jobs. Many of these employees live in Brooklyn, so closing LICH would have devastating economic consequences that would ripple across Brooklyn. And right now, the last thing we want to do is hurt our already fragile economy. In the debate on LICH’s future, we cannot ignore the simple fact that the real estate value of the LICH property is estimated at $500 million dollars. It raises the serious concern that this hospital may be viewed more valuable closed than open. But whatever profits SUNY might gain from real estate will be more than offset by the loss in jobs and valuable medical service to our community. It’s plain to see that closing LICH would be a serious mistake, so I call on SUNY’s board to rethink this rash decision and continue working to find alternative solutions that would ensure that Brooklynites do not lose critical medical services. 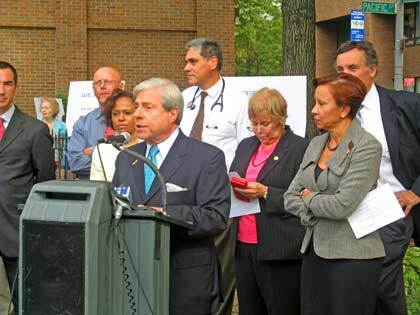 Thank you, Marty Markowitz — let’s get out there and support LICH and protest its closing! I would urge all who care about keeping LICH open to take a minute and call or email his office and tell him that you strongly support his efforts to keep this vital institution open. I just emailed him, it only took 30 seconds! Marty for governor. Coumo is a failure. Marty loves Brooklyn too much. He’d be miserable in Albany. Hi – I agree with you Remsen!! We need to Support! Senator Squadron’s office is urging LICH supporters to attend the community forum on Thursday Feb. 14th from 6 PM to 8 PM at the Kane Street Synagogue at 263 Kane Street (between Court and Clinton). For more information contact Michelle Green at 718-714-8863 or michelle.green@nysna.org. FYI – In addition to Nydia Velasquez, Belinda Cape will attend tonight’s annual Brooklyn Heights Assn. meeting at 7:30 PM in the St. Francis College auditorium. Ms. Cape is representing Senator Daniel Squadron, who is currently away in Albany.